Our mission at Elk Valley Family Chiropractic is to transform lives, with every adjustment, serving to unleash a lifetime of optimum potential in all humanity. Have you been to Medical Doctors and specialists and been told the only solution for your condition is drugs or surgery? Chiropractic care can help you. Chiropractic is safe, even for children and pregnant women! We adjust families consisting of multiple generations and look forward to meeting yours. We use a combination of traditional chiropractic care, advanced techniques and orthotics customized to suit you. Through educational opportunities, we help you achieve your health and wellness goals. Whether you are looking for relief care or total wellness, we can help. Take a look around our website, then contact Dr. Mike Rumpel in our Fernie office to find out how we can help you. Am excited to start this journey with Dr. Mike and the wonderful staff. Incredible personal information, not just generic counseling and care. Will be referring this experience with many who can also benefit. I am so glad I followed through and sought you out. I am very grateful for all the time you took to explain everything. I am very hopeful for the future. Thanks again! The staff are all extremely friendly and helpful! The clinic is set up very well and runs smoothly. It is clear Dr. Mike loves what he does! I felt the appointment was efficient and informative, and friendly atmosphere. I find Dr Mike is very thorough and recommend him to anybody that needs help. His seminars at the college are a bonus. Very informative and fun. The most positive atmosphere I’ve ever been in! Beautiful people and place, thrilled to be working towards wellness with you all. 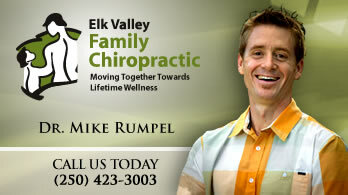 I am very happy with all the aspects of my chiropractic care that Elk Valley Chiropractic provides. From the adjustments themselves, to scans, advice on healthy habits to develop and finally, amazing customer service and atmosphere that the entire team provides, I am happy to recommend them to anyone. Very friendly, warm and attentive staff. Dr.Mike is genuine and caring. Your story is amazing Dr. Mike. No wonder you want to share chiropractic with the world. Great service for over the last 7 years! Love the way this clinic works! Very positive! It’s very nice and accommodating. Everything that I don’t really know is well explained. And it’s very detailed. It’s a great experience to learn before you get your self treated. I was very impressed with all the information I received. I felt very well taken care of. I wish I would have come sooner. Thanks for everything. Lovely friendly staff. Have great confidence in practitioner. Feel I am in very secure hands. Am excited to start this journey with Dr. Mike and the wonderful staff. Incredible personal information, not just generic counciling and care. Will be referring this experience with many who can also benefit. Staff was extremely helpful and answered all my questions as well as made me feel comfortable walking into a new environment. Very informative. Nothing like I expected from a chiropractor. Now I have a real view and understanding of what’s going on with my spine awesome. Thank you. than I had hoped for. Thanks! I look forward to each visit and overall improved health.